Rate of adoption is a key feature of the theory – Everett Rogers developed adopter categories to ‘measure’ innovativeness of farmers to produce a statistical model (normal distribution curve) to show the distribution of the five adopter categories over the average time of adoption, please see the diagram below. 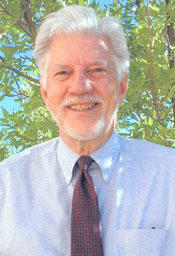 Everett M. Rogers is considered a founder of the Diffusion of Innovations theory. Rogers undertook a PhD (doctoral dissertation) in 1957 analysing the diffusion of several agricultural innovations in a rural community in Iowa. Rogers was convinced that the adoption of innovations follows a universal process of social change. It originated in communications to explain how, over time, an idea or product gains momentum and spreads (or diffuses, hence the name) through a specific population or social system. There are four main interacting elements of the key concept: Diffusion of Innovations – 1) an innovation, 2) communicated through certain channels, 3) over time and 4) among members of a social system. These four elements are present in every diffusion research study and in every diffusion program (i.e. the main elements are the variables in the diffusion process). Play an important role in introducing innovations into the system and plays a gatekeeper role in the flow of information in a social system. Has a central position in the social system (communication network). Serve as important links in the diffusion process as they are the connection between very early and the relatively late adopters. Possibly have few resources therefore most of the uncertainty of the innovation must be removed before the late majority feel comfortable with adopting innovations. Blame for not adopting can be located at the individual and system level. The implication of adopting the theory is that extension professionals/practitioners need to develop different practices/messages for different ‘types’ of adopters (i.e. farmer segmentation). Relative Advantage – The degree to which an innovation is seen as better than the idea, program, or product it replaces. Compatibility – How consistent the innovation is with the values, experiences, and needs of the potential adopters. Complexity – How difficult the innovation is to understand and/or use. Trial ability – The extent to which the innovation can be tested or experimented with before a commitment to adopt is made. Observability – The extent to which the innovation provides tangible results. 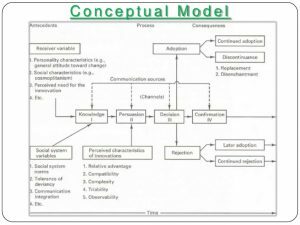 Source: Conceptual model of Diffusion of Innovations- Rogers, E.M. (1995). Diffusion of innovations (4th edition). The Free Press. New York. The theory has been used in rural sociology/agricultural extension and also in disciplines such as anthropology, public health and general sociology. In respect to the agricultural sector it has been widely used by extension program planners, evaluators and researchers to develop an understanding of the reasons why extension programs result in adoption or rejection of a particular new practice. It also provides a general understanding of the impact of extension programs through the extent/degree of innovation adoption. Many governments of developing economies have used the Diffusion of Innovations theory to shape the conceptual framework and implementation design of international rural development programs. Publicised criticisms of the theory started to appear in the 1970s in the context of international development projects (Rogers, 2003). The key criticism was that innovations were being targeted to the “Innovators” and “Early Adopters” – the more ‘progressive’ farmers, with the expectation that innovative practices would trickle down to the majority of farmers. However, the reality was that the application of the theory was viewed as a source of inequity, dividing rural communities and not benefitting/assisting those in most need. This was particularly noticeable when the diffusion of innovations process benefited larger farmers by increasing their production but decreasing the market prices/farm gate returns received by all farmers in the region (including the non-adopters) (http://opendocs.ids.ac.uk/opendocs/handle/123456789/602#.VuEUoUYutAM; Goss, 1979). A Pro-Innovation Bias – There is the implication that an innovation should be diffused and adopted by all farmers. The act of innovating is considered positive and the act of rejecting an innovation is considered negative. Individual-Blame Bias – The development agency is not blamed for its lack of response to the needs of farmers. Rather, the individuals who do not adopt the innovation are blamed for their lack of response. Issue of Equality – The negative impacts of the theory are not considered. What are the consequences in terms of unemployment, migration of rural people and equitable distribution of incomes? Will the innovation widen or narrow socioeconomic gaps? Bias in Favour of Larger and Wealthier Farmers – Innovation investors tend to target the already innovative, successful and information-seeking farmers who have the capacity to resource themselves to experiment and adopt an innovation – which can lead to great productivity/profitability, consequently the social divide amongst farmers widens as a result. It tends to assume innovations originate at research institutes/central agency rather than farmers themselves, other players in the RD&E system. It assumes adoption of innovation is always desirable (normative), it tends not to evaluate innovations from an end-user perspective. There is a risk of technical/research messages being lost in translation to the farmer because of the language used. It assumes there is enough research information available to the extension/change agent and does not tend to see knowledge as a combination of research outputs plus the farmer’s knowledge, experience and interpretation of the problem. 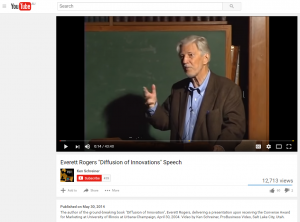 To see Everett Rogers “Diffusion of Innovations” Speech, watch the ProBusiness Video and Schreiner Productions, Salt Lake City, Utah YouTube Video https://www.youtube.com/watch?v=j1uc7yZH6eU Published May 30th, 2014. Beever, G. (2018). Blog post: Diffusion of Innovations Theory: Case Studies and Discussion. extensionAUS, Extension Practice.